In June 2018 I experienced floaters in my eye. This resulted in me having to have emergency laser surgery on a tear in my retina. There is a history of detached retinas on the maternal side of my family. The inner artist came out in full force during this ‘brush with lost eyesight’ experience. First, I wrote a fictional account about the experience. Somehow through using the fictional story telling lens rather than memoir writing techniques, I could more honestly integrate the emotional response of my ‘character.’ There was greater clarity in the writing rather than pouring my own emotions into a retell. Secondly, I researched visual artists and authors who are blind and still manage to create (visual art, writing). Here are some of what I wanted to share with you. Esref Armagan was born with non-functioning eyes. He is a Turkish-born visual artist whose work is simply amazing. He starts his paintings by using a Braille stylus to etch the outline of his sketches. Then he uses his fingers and oil paint to apply colour. He doesn’t want his colours to smudge so he allows the paints to completely dry between applications. He apparently receives no assistance from others during the process. 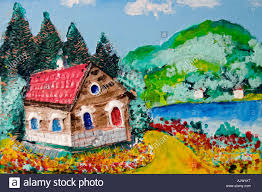 He requires complete silence in order to paint. To learn more go here. Art by EsrefArmagan ~ Image source click here. Jorge Luis Borges, Argentine writer ~ A prolific writer and thinker, this writer’s vision deteriorated in the latter part of his life. His mother, who lived until age 99, became his personal secretary, recording his thoughts and ideas. Learn more here. 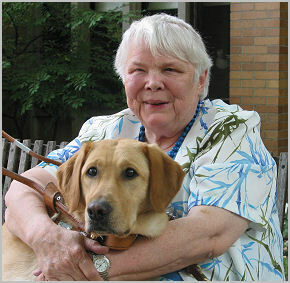 Jean Little, Guelph Ontario ~ I learned about Jean Little when our children were in elementary school. They often borrowed her novels from the school library. Jean is a prolific writer. Blind since birth, she uses a talking computer to create her stories. Jean enrolled in regular classes in elementary and secondary school and has a university degree in English Language and Literature. She has a seeing eye dog, Honey. Learn more about Jean here. Do you have a special affinity to an artist (visual, musical, dance) and/or writer who is faced with physical/mental challenges? If so, please add a comment to the comment page on my website.